This is going to be a perfect storm! Over 170 condo towers are currently under construction in Toronto with over 90,000 units in the pipeline according to Scotia Bank. 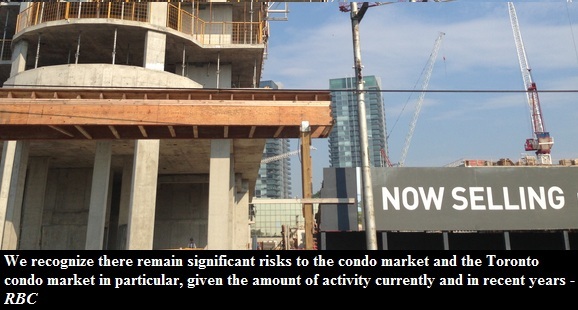 Yet new condo sales were down by 30% this past May in the GTA and the inventory is on the rise. The Toronto condo bubble is larger than ever before! The issue is not only that condo prices went up by almost 70% in downtown Toronto over the past ten years, but also the fact that the majority of the condos are being sold to speculators. Urbanation claims that many condominium projects in downtown Toronto sell over 70% of their units to investors. Overall Scotia Bank estimates that somewhere between 45% to 60% of condo sales went to speculators in recent years. Many investors are running a negative cash flow as they rent their units for less than the carrying cost. As long as the their condos keep rising in value there is no problem. The annual appreciation of 4% on a $350,000 unit will yield $14,000. So even with a negative monthly cash flow of $300, you would still make a return of $10,400 by the end of the year. But what happens when the real estate appreciation stops? Prices can't keep on rising faster than incomes forever! Would investors hold on to their units or dump them as fast as possible to minimize their loses? Even if the Toronto condo market is heading for a soft landing where prices flat line, why would investors throw away $300 a month? With annual property appreciation of 0% there would be no $10,400 return, instead there would be a loss of $3,600 every 12 month. Logically speaking, even under a "soft landing" scenario it makes sense for investors to sell as their units become money drainers - costing them $300 a month. Continue reading to see the attached graphs. The graph below shows the existing condo stock and the number of units under construction in Toronto. The graph below shows Royal Bank's estimate of the number of Toronto condo units to be completed in 2013, 2014, 2015 and 2016. The graph below shows the number of unsold units in Toronto. Note that most of the inventory is in the pre-construction phase. The graph below shows the number of condo buildings under construction in Toronto. Notice how Toronto is building almost twice as many condos as New York - a city that has triple the population. 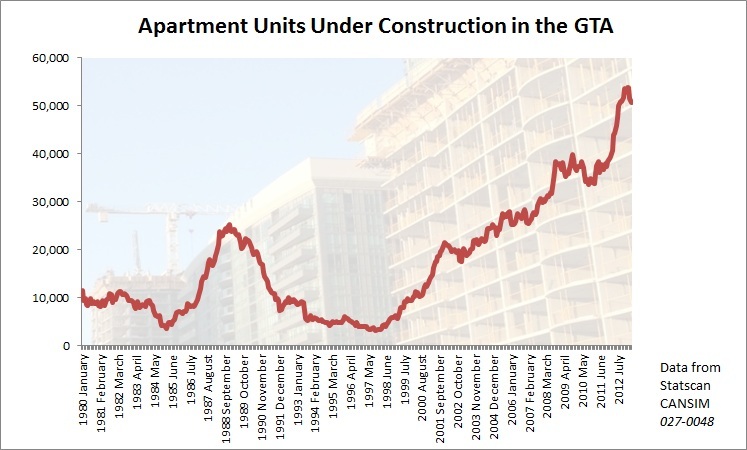 The Toronto condo bubble is a construction bubble. In the graph below notice the last condo bubble in Toronto during late '80s and compare it to the present one. The number of condo units won't be going up anymore with new condo sales going down for the past ten months. 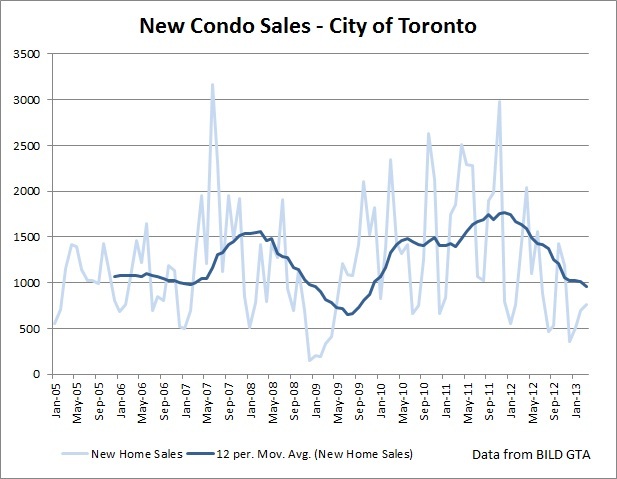 The graph below shows the number of new condo sales in Toronto between 2005 and 2013. As the sales volume of new condos declined so did the number of building permits in the City of Toronto. The graph below shows just that.